Dylan Muldoon’s Sophomore Bates Squash teammate Omar Attia won his match at the No. 3 position by a count of 3-2 to clinch a thrilling 5-4 victory for the No. 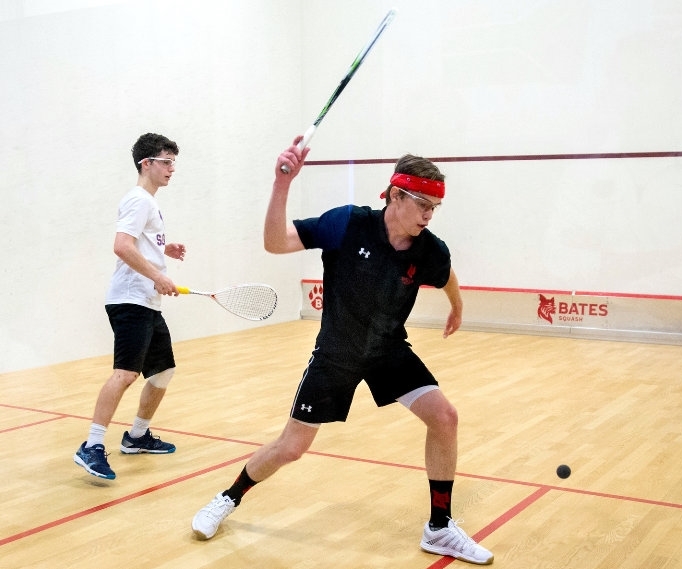 20 nationally ranked Bates Men's Squash team over No. 18 Dickinson. Attia behind two games to one before taking the fourth game by a count of 11-6. It all came down to the fifth game and Attia won 12-10 to clinch the 3-2 with scores of 11-6, 9-11, 6-11, 11-6, 12-10 victory over Alexander Wattles and give Bates (1-0) the 5-4 upset win over the Red Devils (0-3). The Bates' pair of senior captains displayed great leadership, winning their respective matches. Senior captain Coley Cannon swept Hal Holappa by a count of 3-0 at the No. 4 position 11-6, 11-3, 11-7 and senior captain McLeod Abbott won 3-1 over Andrew Strudwick at the No. 8 position 14-12, 11-8, 8-11, 11-9. Junior Garon Rothenberg delivered a closely contested win as well. He prevailed 3-2 at the No. 6 position over Henry Smith 3-11, 13-11, 11-6, 8-11, 11-9. And in a strong start to his collegiate career, first-year Jesper Phillips defeated Tanay Murdia 3-1 at the No. 5 position 11-7, 10-12, 11-9, 11-4. Muldoon playing in the number 9 position went down 3 – 0 to Osuman Imoro 11-9, 11-5, 11-5.